The reciprocal Trigonometric function of Sine is Cosecant, of Cosine is Secant & for Tangent it is Cotangent. So, we can also represent Cot θ as Cos θ/Sin θ. In trigonometry the inverse trigonometric functions sin-1 , cos-1, tan-1, csc-1, sec-1, cot-1 (aka cyclometric functions) are the inverse functions of sin, cos, tan, csc, sec, cot respectively. 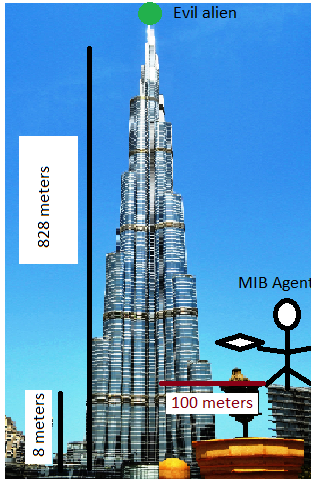 There's an alien standing on the top of Burj khalifa (828 meters), and there's a MIB agent standing on the roof of another building 8 meters long and the distance between the base of the burj khalifa and the building where the agent is standing is 100 meters. 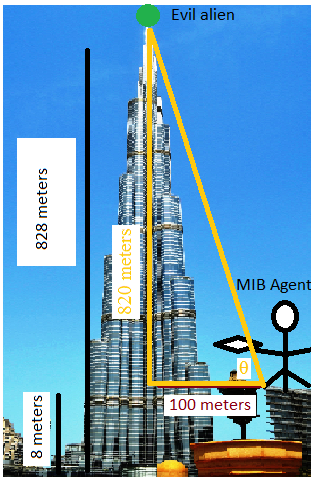 Find the angle at which the agent should shoot his Ray gun to vaporize the alien. Round off your answer to the nearest hundredths. I hope you liked the post, if you have any doubt, leave it in the comments section below. In the next post we will move on to trigonometry with general triangles and also some special right triangles.